This is a re-post from my previous blog, Good Morning and Shine, which turned into A Brush of Southern. 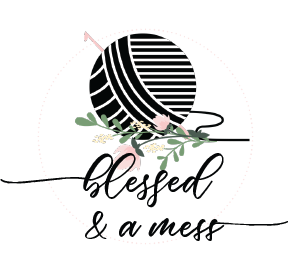 The blog is still currently up with a lot of recipes from my first go around with the blog, and some posts about where I live in Kentucky with the second go around. A Brush of Southern is still up but is for now on hiatus, due to my lack of time, funds, and equipment to explore the area. Anyways I am super twitter-pated with bow fashion Although I feel like I can’t pull off wearing a bow personally, I really like bow incorporated accessories. 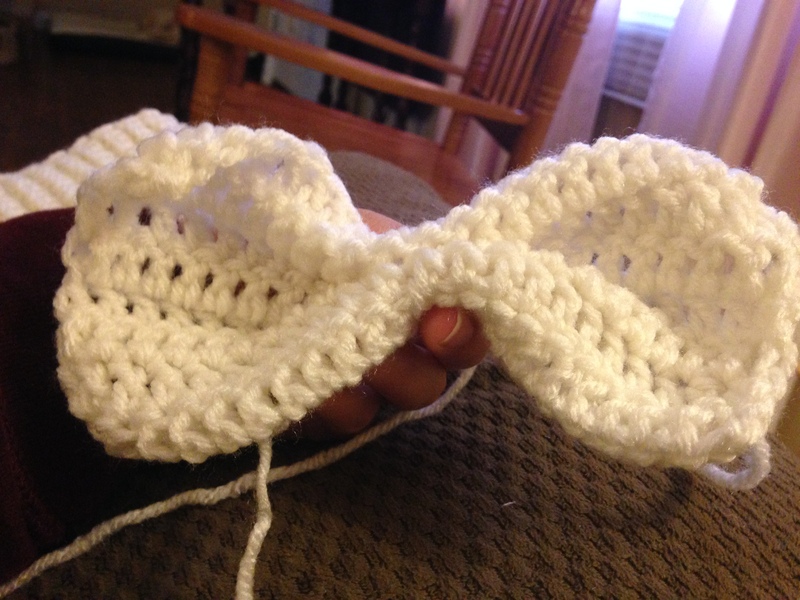 I have been making ear warmers for years and have usually tacked a crocheted flower on them at the end, to make them look cuter. This time, however, I have been inspired by the texture given by the back loop stitch, if you can’t already tell by my Thick and Easy Crochet Infinity Scarf Pattern. Thus, I have incorporated it into a my new pattern. Tip: This may be too big or too small, depending on head size. Simply increase or decrease rows for desired fit. 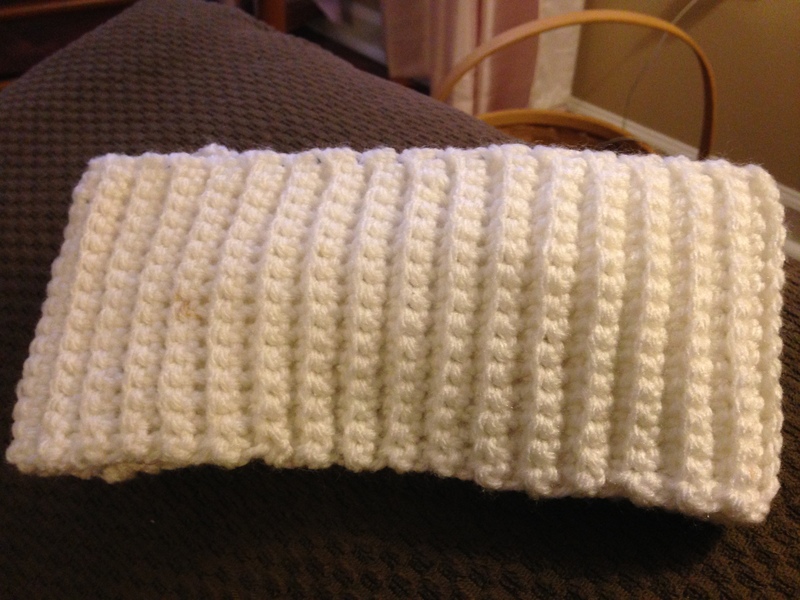 At the end of the of the 74th row, leave a long tail of yarn. 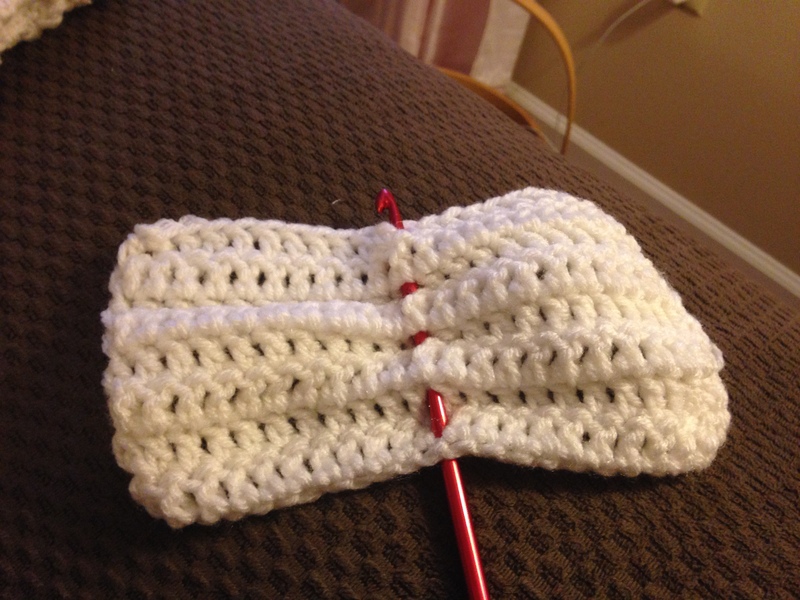 Fold R1 with R74 together (or the last row you crocheted). Tip: Make sure the band is straight and not twisted. Next you are going to be using a series of slip stitches to bind the two edges together to complete the band. Push your needle through the first stitch of R1, into the first stitch of R74. Hook the tail, and Sl St through both stitches. Then push the needle through the 2nd stitch of R74 into the 2nd stitch of R1 and sl st through that one. Repeat for the rest of the width of the band. 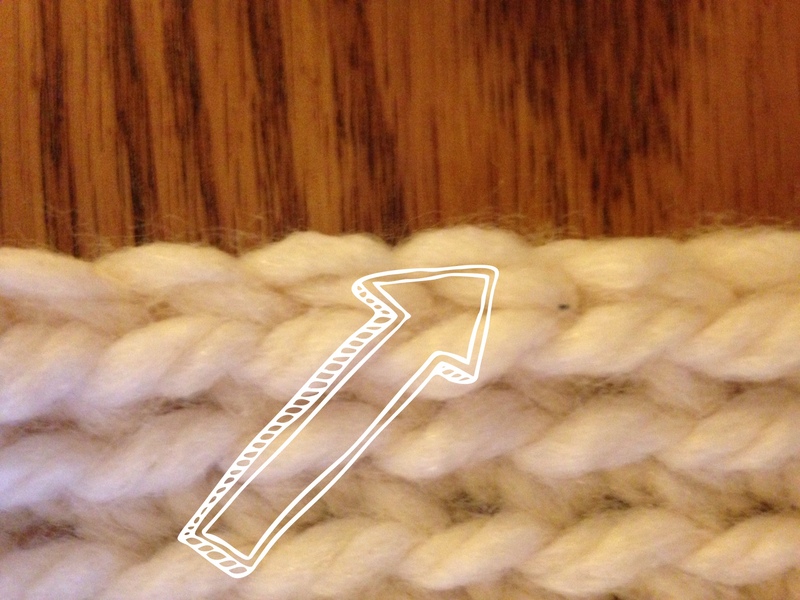 Tip: Make sure you are lining up the stitches from both ends of the band correctly. Once you are finished combining the 15th stitches of R1 & R74, weave in any extras of the tail. 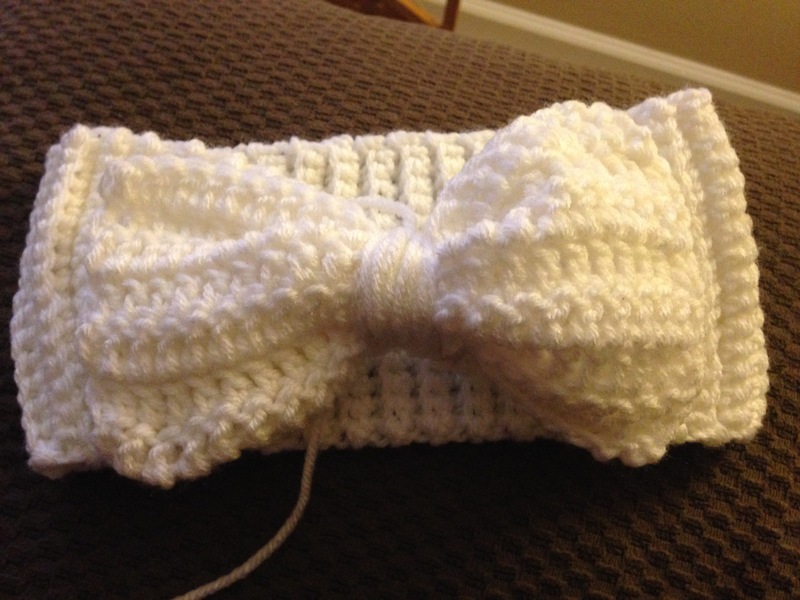 There will be a seam, however it blends in with the bumpy texture of the band or can be hidden behind the bow. 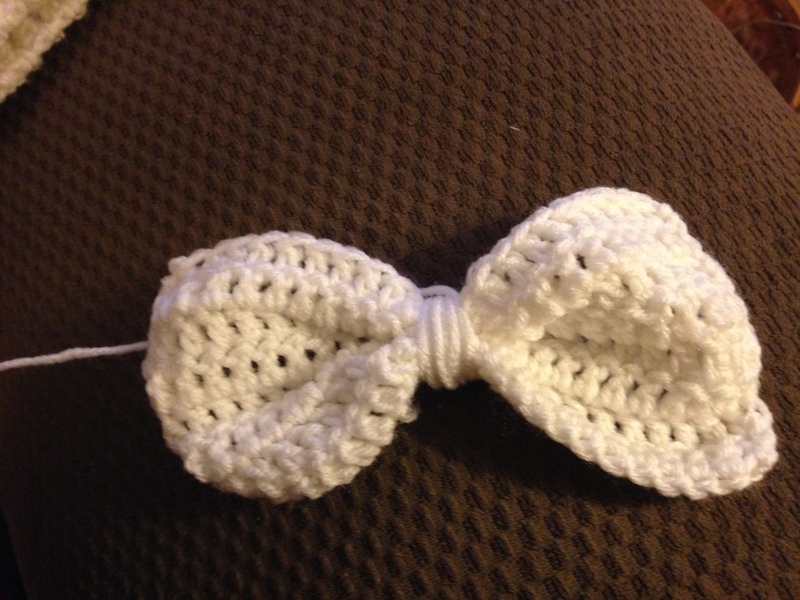 First of all I liked my bow this size, however you can make the bow as big and as wide as you please. This is where it is optional to use a tapestry needle. I turned my apartment upside down to find my tapestry needle and still could not find it. Thus instead of going out and buying my millionth yarn needle, I made wise use of my hook. 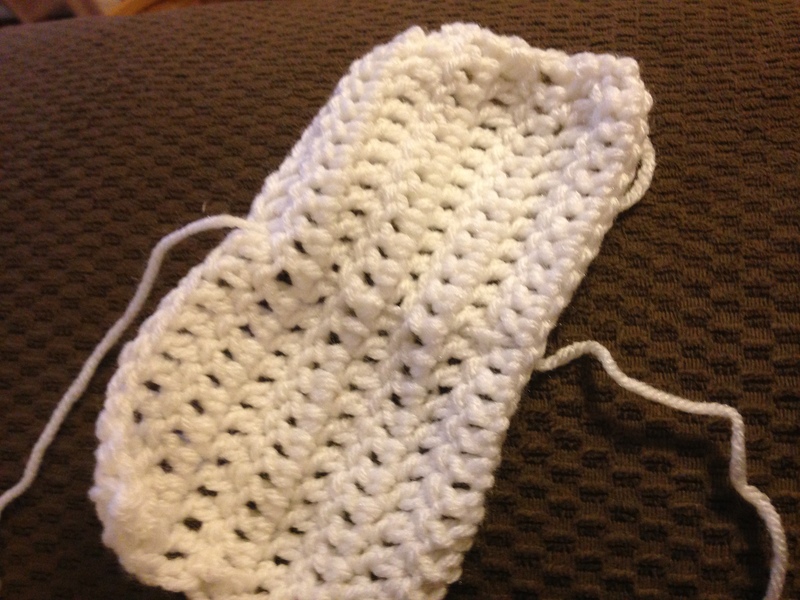 I made sure to include pictures of just how exactly I modified the pattern. You can pull the tapestry needle with a very long strand of yarn, vertically through the center of the bow. OR weave your hook through the vertical center of the bow, as shown below. Pull the long strand until only about an inch or two is left. Then, creasing the center of the bow to make a horizontal pleat (which gives it a full, bow look), tightly wrap the long strand several times around the center so the crease stays. Once you are confident the bow can retain it’s shape, find a place on the band (I chose the point with the seam), and like you did with the bow, make a horizontal pleat. Continue wrapping the bow, and now as well as the band, to not only combine the bow to the band, to solidify the band’s pleat as well. Just weave in the strands and TADA! 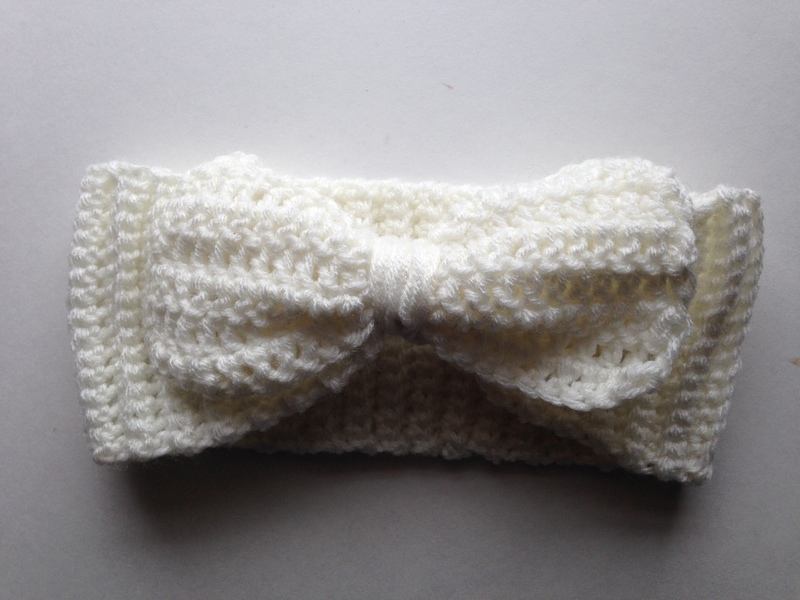 This cute accessory…with a bow! This is just in time for our second wave of winter, because tonight is forecasting 8-10 inches of snow… Good thing I’m stocked up with yarn and projects! Let me know if this pattern is clear enough or how your projects turn out! 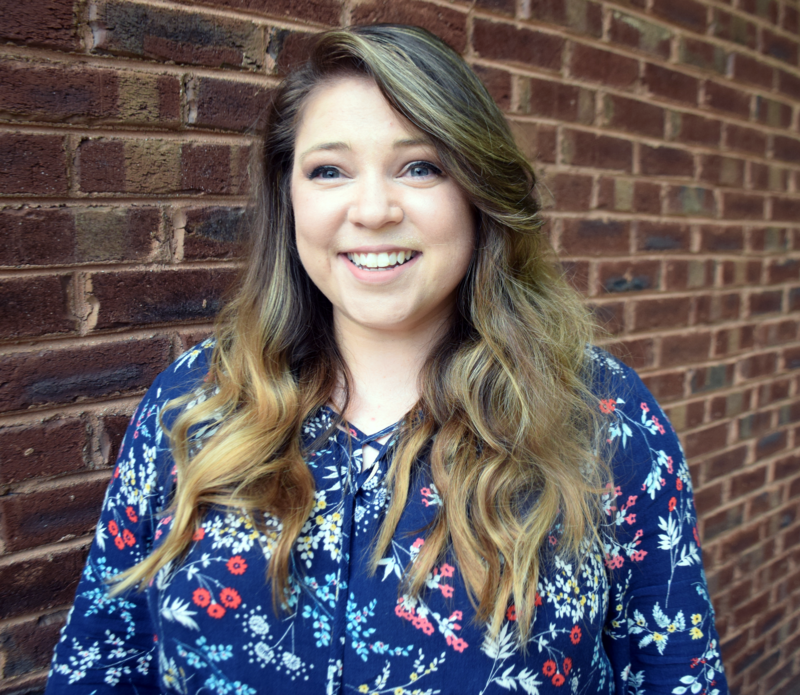 ← Did I Just Graduate College or Kindergarten?